Is Applied Materials, Inc. (NASDAQ:AMAT) a good place to invest some of your money right now? We can gain invaluable insight to help us answer that question by studying the investment trends of top investors, who employ world-class Ivy League graduates, who are given immense resources and industry contacts to put their financial expertise to work. The top picks of these firms have historically outperformed the market when we account for known risk factors, making them very valuable investment ideas. Applied Materials, Inc. (NASDAQ:AMAT) has seen a decrease in enthusiasm from smart money of late. AMAT was in 43 hedge funds’ portfolios at the end of the third quarter of 2018. 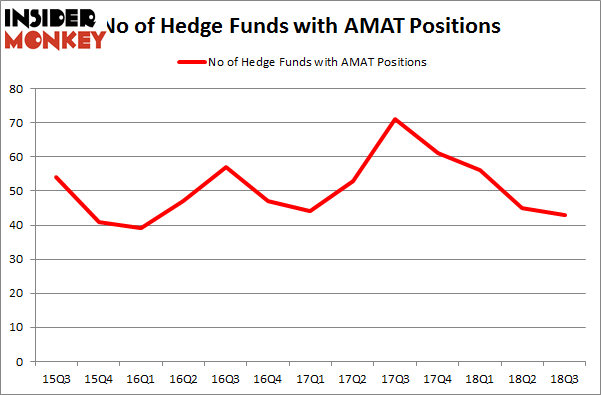 There were 45 hedge funds in our database with AMAT positions at the end of the previous quarter. Our calculations also showed that AMAT isn’t among the 30 most popular stocks among hedge funds. We’re going to check out the new hedge fund action encompassing Applied Materials, Inc. (NASDAQ:AMAT). At the end of the third quarter, a total of 43 of the hedge funds tracked by Insider Monkey held long positions in this stock, a change of -4% from the previous quarter. The graph below displays the number of hedge funds with bullish position in AMAT over the last 13 quarters. With hedge funds’ sentiment swirling, there exists a select group of noteworthy hedge fund managers who were increasing their holdings significantly (or already accumulated large positions). The largest stake in Applied Materials, Inc. (NASDAQ:AMAT) was held by AQR Capital Management, which reported holding $511.2 million worth of stock at the end of September. It was followed by D E Shaw with a $335 million position. Other investors bullish on the company included Lansdowne Partners, Citadel Investment Group, and Renaissance Technologies. 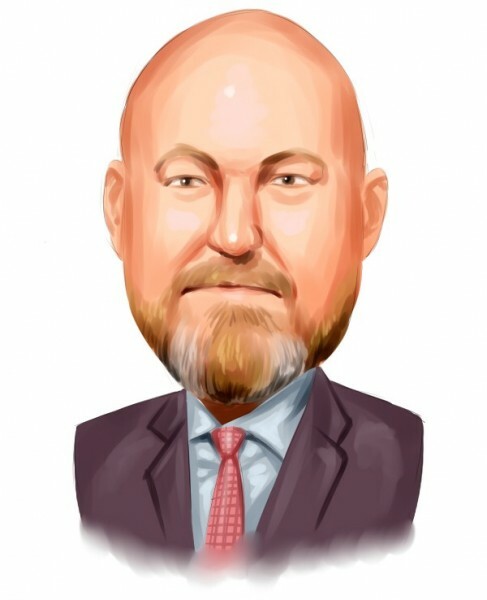 Since Applied Materials, Inc. (NASDAQ:AMAT) has faced a decline in interest from the aggregate hedge fund industry, we can see that there lies a certain “tier” of fund managers who sold off their full holdings in the third quarter. Interestingly, John Armitage’s Egerton Capital Limited said goodbye to the biggest investment of all the hedgies followed by Insider Monkey, comprising close to $109.6 million in stock. Principal Global Investors’s fund, Columbus Circle Investors, also sold off its stock, about $28.3 million worth. These moves are intriguing to say the least, as total hedge fund interest fell by 2 funds in the third quarter. Let’s go over hedge fund activity in other stocks similar to Applied Materials, Inc. (NASDAQ:AMAT). We will take a look at JD.Com Inc (NASDAQ:JD), BB&T Corporation (NYSE:BBT), Eaton Corporation plc (NYSE:ETN), and Aon plc (NYSE:AON). This group of stocks’ market values match AMAT’s market value. As you can see these stocks had an average of 30 hedge funds with bullish positions and the average amount invested in these stocks was $1.78 billion. That figure was $1.99 billion in AMAT’s case. Eaton Corporation plc (NYSE:ETN) is the most popular stock in this table. On the other hand BB&T Corporation (NYSE:BBT) is the least popular one with only 20 bullish hedge fund positions. Compared to these stocks Applied Materials, Inc. (NASDAQ:AMAT) is more popular among hedge funds. Considering that hedge funds are fond of this stock in relation to its market cap peers, it may be a good idea to analyze it in detail and potentially include it in your portfolio.